Since Mom works from home on Thursdays, she plows through an average of 500-600 emails during the day. Some she can automatically delete, some she saves for quality reading later, and the rest she skims right then and there. Just like JJ, who organizes her toys by room, Mom organizes many of her emails in Outlook folders. Two emails made it to the K9 folder yesterday for sharing today. 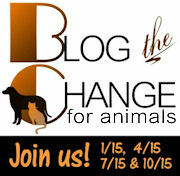 Last Sunday, Blog the Change for Animals held their quarterly posting day. 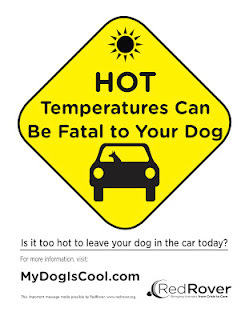 Several posts covered the subject of dogs left in cars during warm months. We visited a great link from one of the blogs and decided to post the yellow badge you will see on the right side of our blog now. Living in the tropics, most humans “get it”, however, every now and then you will see a K9 trapped in the oven car. 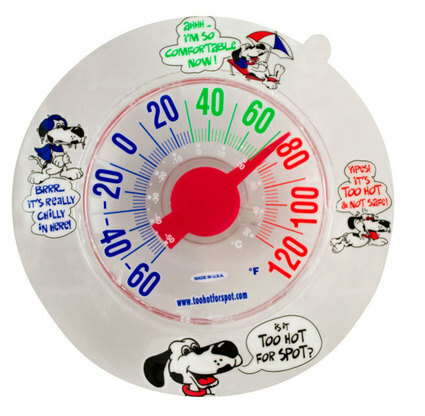 Mom read about this great Dog Safety thermometer tool which makes the point even more OBVIOUS for those humans who aren’t exactly sure when the temperature = DANGEROUS! The next item Mom read to JJ and I, ok, then we watched the video for a minute or so, will provide your awww, so cute moment for the day. 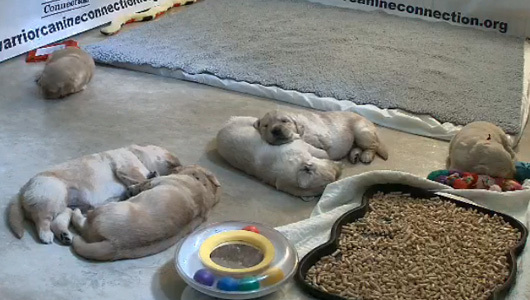 You can watch Holly’s Half Dozen (6 golden puppies) puppy cam 24/7 for 8-10 weeks to see the evolution of this group of puppies as they train for their future as service dogs for Veterans with PTSD. Warrior Canine Connection bridges patients from Walter Reed Military Medical Center and the National Intrepid Center of Excellence provide with the puppies to provide social interaction training. Win-Win all around! Another great, glad Mom reads so much, day. This entry was posted in Behavior, Culture, Family and tagged animals, blog the change for animals, dog safety, dog safety thermometer, golden puppies, Holly's Half Dozen, National Intrepid Center of Excellence, ptsd, puppy cam, Service dogs, veterans, Walter Reed, Warrior Canine Connection by heyitsjethere. Bookmark the permalink. Hey Litchi, Jet here. Hi Miss Susan. Hi sweet Jetty – sorry I missed your pawsome swimming post yesterday – it didn;t show up until this morning??? But I have to tell you how great you looked in the pool – I;m so glad you had fun! Great recap of some impawtant info! You stay coll big guy. And those puppies soooooo cute! holy codfish!! that is hot, hot, hot…and with the humidity…ugh! We liked the image, too and hope it keeps the message front and center. Have a great weekend Snoop, don’t get into too much mischief. So glad you found the info helpful like we did. We do NOT want to be a PUP pie! Hi sweet Jetty – I know I always worry about animals left in hot cars – is sure has been super hot hasn’t it!! and what is cuter than those puppers??? and how what a special and important job they have ahead of them!! I hope you and JJ had a nice day and stayed cool! I had a fun day at petsmart – sold a ton, plus got to snuggle a doxie, 2 chi’s, an all white husky (I thought it was a Samoyan but it was a white husky!! ), a weimarana, 2 pittys, several yorkies and a beagle! so much doggy love!! No goldens or flat coats boo!!!! p.s. how are Neves ears?? less red I hope! Also how is Rachels Nana? Oh gosh, did you guys have a rough night like we did? I think I’m improving a smidge because JJ needs more help. Mom spent some time in the closet with JJ again last night. I ended up fast asleep in Rachel’s closet and Mom didn’t know where I was this morning until she heard me scratching at Rachel’s door. Did you vote for Jack?